Every type has their own strengths when it comes to being an entrepreneur or owning their own business. Entrepreneurship is an empowering path that can allow each type to really showcase their strengths and carve out a niche that allows their skills to flourish. 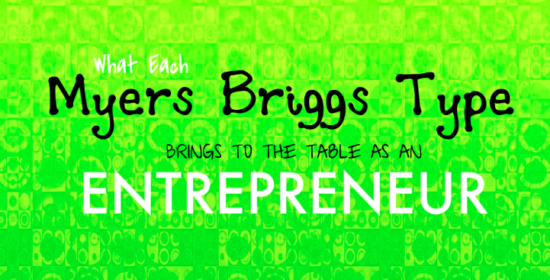 We’re going to talk about what each type brings to entrepreneurship. The ISTJ is very committed to their goals and want to get things accomplished. The ISTJ has a no nonsense straightforward style that allows them to continue their goals and build something over the long term. Many entrepreneurs struggle with this commitment, so an ISTJ just showing up every day and getting things done really helps set them ahead of the competition. The ISFJ is a very caring type. They are able to pay attention and attend to the needs of others. If the ISFJ is in a service-oriented business, they will be hard to compete with due to their level of consistency and caring about others. They are driven by being people oriented and are very good with paying attention to details. Once they figure out how everything works, they can build on their consistency to make sure everything continues to run smoothly. The ISTP has a natural ability to see where problems lie, and has a no-nonsense approach to fixing them. The ISTP is able to fix problems that arise once they understanding the intricacies of the system. This allows them as entrepreneurs to become experts in their field, and apply their skills to anything that involves bringing together things that are broken and executing on them in a way that improves the system as a whole. The ESTJ is the natural organizer that is focused on effective ways to get things done. The ESTJs natural desire to want things to be in order will go a long way as they build and command a team to carry out their entrepreneurial idea. The ESTJ knows just the right way to motivate each team member and their focus on goals will help make sure everything gets done and runs smoothly. The ESFJ is a people person and they take the time to understand everyone around them. The ESFJ will find roles for everyone to do their job to the best of their ability. The ESFJ understands trends and what is popular, and can use this ability to capitalize on new opportunities as an entrepreneur. Their organization skills will also help make sure people stay on track. The ESTP is the true doer of entrepreneurs. They set their sights on a goal and aren’t afraid to take action to make it happen. ESTPs have great sales skills and can use their sheer will and determination to blaze a path in the entrepreneurial world. The ESFP is a natural when it comes to understanding people and navigating the social world. The ESFP knows how to get the right people around them to make their vision a reality. ESFPs willingness to push the envelope, and their ability to be organized when they put their mind to it makes them great managers of a team and can bring excitement and energy that helps lead their team to success. The INTJ is also a popular type in entrepreneurship. The INTJ enjoys envisioning a future and wants to apply their ideas to the real world. The INTJ can take a business idea or concept and think through ways to make their idea a reality. The INTJ can create order and structure to their environment, which allows them to build a strong and sustainable business in line with their goals and vision. The INFJ is blessed with a deep understanding of the world and people. They understand how people tick and can use this understanding to inspire and create a vision for the world. The INFJ can use these skills to blaze a new entrepreneurial path that strongly aligns with their values. The INFJ’s passion is contagious and they can use this to inspire others to join in their vision. The INTP has an ability to understand complex concepts in a multitude of fields. This deep understanding allows the INTP to seek out commonalities in concepts and ideas and apply them to a new field or area of expertise. The book “Blue Ocean Strategy” is one that an INTP can apply to their business. “Blue Ocean Strategy” is about creating new markets by taking two previous markets and creating something of higher value. The INTP’s strong technical skills and foresight should allow them to converge on these opportunities and create a place where there is very little competition and they can own the marketplace. The INFP brings a strong sense of their individual expression to their work and this allows for them to create new markets. The INFP can create original works and ideas that allow them to become successful entrepreneurs. The INFP passion and dedication to their work can shine through as they invite others into their world. The ENTJ has a decisive no-nonsense approach when it comes to their entrepreneurial endeavors. With their desire for organizing and creating structure to their environment, the ENTJ can combine this with their long term vision to achieve their lofty goals. The ENTJs confidence can rub off on their team and help them reach new heights. The ENFJ has a big knack for understanding people and where they would fit best in an organization. The ENFJ plays to their employees strengths and can build a huge team that has a lot of goals. An ENFJ with a strong vision can build a company that is huge and has the talent to reach their goals. The ENTP is the idea person. ENTPs are over represented in entrepreneurship and this is because of their desire to explore and create new things. The ENTP has a very inventive mind and is able to see potential in many things. They also are very outgoing and can understand where the marketplace and trends are going. By doing so, they can create a new product or business that is truly desired by many people.